"He'll go to the ends of the Earth to protect you." The major Spider-Man storyline of 2012, and part of the 50th anniversary of Spider-Man's first appearance. Otto Octavius is dying. Thanks to the various injuries suffered in fights against Spider-Man, Captain America and others, Doctor Octopus has found his body failing him and after months of failing to find a cure, he has instead decided to focus on the legacy he will leave behind - Otto Octavius has found a way to stop Global Warming. Supposedly. Spider-Man doesn't trust him, for good reason. If Octavius is lying or not is irrelevant - he's holding the world hostage with his dying breath. What price will Spider-Man have to pay to stop him and buy the world another day? And what if Doctor Octopus is telling the truth? And I Must Scream: The Octo-bot controlled Avengers - Black Widow notes that Captain America is far more sluggish than he should be, even when she compensates for his being Brainwashed and Crazy; and after being freed, Thor apologises for attacking Spider-Man & says he held back his punches as much as he could. Bittersweet Ending: Spider-Man is proven right about Octavius's true intentions, and he manages to stop the Octavian Lense from going online. However, Rhino dies when Otto floods the Octathedral and Rhino pins Sable down as the water level rises, intending to drown her and himself. According to Madame Webb, however, Sable is alive. Worst of all, it's not over. This story serves as a set-up for Ock's return as the Superior Spider-Man. C-List Fodder: Poor Brian Hibbs/Kangaroo II. Crazy-Prepared: Spider-Man debuts a new set of Spider-Armor, designed specifically to combat the Sinister Six, and brings a team of Avengers specifically selected to match the Sinister Six. Unfortunately, Doc Ock is several moves ahead. Dude, Where's My Respect? : After the UN dismiss Spider-Man's warnings about Octavius out of hand, Thor steps in. Thor: I am Thor Odinson, heir to the lord of Asgard, and this man is my most trusted counsel. Enemy Mine/HeelFace Turn: Mysterio turns on Ock when Spider-Man points out that for all of Mysterio's loyalty to Octavius, if Spider-Man's right about Ock, then Mysterio's going to burn with the rest of the world and the two billion dollars that the Sinister Six were each given will be worthless. Fighting Your Friend: Spider-Man & Black Widow are forced to fight the rest of the Avengers after Ock uses his Octo-bots to turn them into mindless drones. Finger Poke of Doom: In the first issue, when Ock is thinking about all the injuries he's sustained over the years, one of the injuries is being casually flicked away by Joe Fixit. His internal monologue indicates that it was possibly one of the worst blows he'd ever received. It's All My Fault: Said verbatim by Spider-Man's inner-monologue when he realises that all of Octavius's "toys" are just perversions of things Peter had created at Horizon Labs. Spider-Man, Silver Sable & Black Widow were going to fight Doc Ock to the bitter end, unaware it was really Chameleon in a Doc Ock suit, until the real Otto took over & clued them in it was that was just an imposter. When Spider-Man, Silver Sable, Black Widow & Mysterio fight the mind-controlled Avengers, Ock keeps jumping from Avenger to Avenger as his current puppet is defeated due to Ock not knowing how to best fight to their strengths, eventually reaching Thor, which then causes him to drop Mjölnir as Ock isn't worthy of holding it. Plus, in a literal example of the villain fixing it, Mysterio is the one who manages to free the Avengers from the Octo-bots. Oh, Crap! : Spider-Man when he realises that for all of his prep for the Sinister Six, Ock is still several moves ahead of him. Only Sane Man: Spider-Man, the Avengers and the folks at Horizon Labs, are seemingly the only ones who realise that Octavius is lying. Maybe. Out-of-Character Moment: Some people saw Spidey's willingness to let Silver Sable drip acid onto Sandman to get him to talk as this; he himself admits it's too much for him and six billion lives were at stake, but Peter's usually one to find a better way. Put Them All Out of My Misery: Rhino's motivation is type 4 of this trope, and the reason why he was the only one other than Ock himself to know what the real plan was. 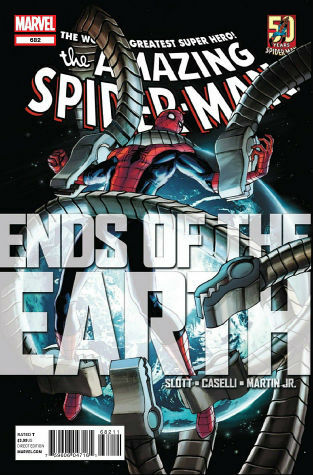 The Reveal: After 5 issues of ambiguity regarding Ock's intentions, if Spider-Man was right about Ock planning to use it to take everyone with him as he dies or Otto genuinely intends to eradicate Global Warming, the final issue reveals that Ock plans neither - he's going to use it to only kill most of the people on Earth, with the remaining 0.08% rebuilding Earth & remembering him as the greatest monster in human history. Screw This, I'm Outta Here! : Pulled by Mysterio after freeing the Avengers from Ock's control & telling Spider-Man & Silver Sable where to find Otto. Take That! : Spider-Man punches out Al Gore. Granted, it's really the Chameleon in disguise, but still. Villainous Breakdown: The entire story arc can be seen as Doc Ock's breakdown in the face of certain inevitable death, but he really starts falling apart when Peter claims that his goal to be remembered as history's greatest monster by the survivors of his scheme is futile because the "survivors'" brains will be cooked, leaving them brain-dead. Doc Ock starts fumbling around with his equipment in denial that he miscalculated, giving Peter a window of opportunity.